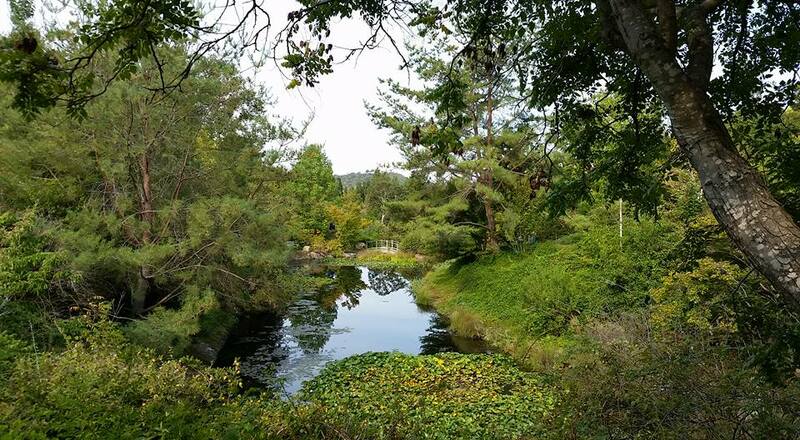 In early September, I had the privilege of attending the annual meeting of the American Conifer Society in Sonoma County, California. My first (and wildly inaccurate) thought was, “What could we possibly see aside from redwoods? There aren’t any conifers that thrive in that area.” Well I couldn’t have been more wrong, as the next two days showed me. 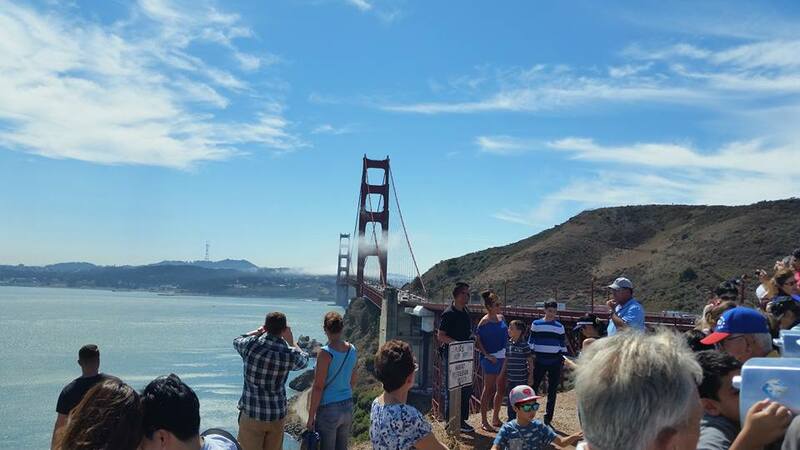 In the early days of colonial settlement, the hills surrounding the Golden Gate Bridge were covered with forests of lush coastal redwood (Sequoia sempervirens). Our first day included stops at one private garden, Hog Hill; a trip to an old growth redwood forest; and a very informative demonstration by the Aesthetic Pruning Association. Hog Hill is notable for having a dawn redwood (Metasequoia glyptostroboides) that is likely one of the very first grown from seed after being rediscovered in China in 1941. The rest of the garden featured a wide array of South African and Mediterranean plants that were well suited to the semiarid climate. The part of the trip I was looking forward to most was next. After waiting my entire life to see them, I was finally getting to see coast redwoods in their home. While I’ll never be able to grow them here in the Chicago area, it was still inspiring to see such majestic trees in person. Armstrong Woods State Natural Reserve was owned by a lumberman in the 1880s who recognized the area’s beauty and set aside this tract of land as a public park. 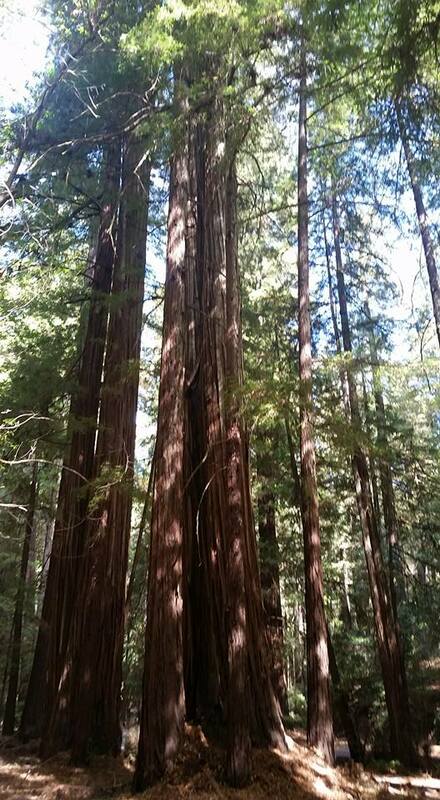 While it doesn’t contain the largest trees in California, it still is home to an outstanding number of trees. Nothing reminds you of how big the world is like standing next to a plant more than 300 feet tall! We also had a chance to take a guided walk with docents from the park, where we learned that the vast majority of wildlife resides way up in the canopy, which explains why the forest floor was so eerily silent. After touring the redwoods, we traveled to Circle Oak Ranch, an equine center that also features an amazing collection of dwarf conifers. Unfortunately, my camera’s battery was dead by this point, so I don’t have any photos to share. We were treated to a tour of the gardens followed by an outstanding pruning demonstration by the Aesthetic Pruning Association. Several volunteers were stationed throughout the gardens giving demonstrations on how to properly prune various growth forms of dwarf conifers. This garden was also a highlight, because it was located in an area that experiences colder temperatures and heavy clay soil, and therefore featured numerous plants that would also thrive in our midwestern climate. The following day was a trip to Quarryhill Botanical Garden. Quarryhill features a vast collection of temperate climate Asian plants. More than 90 percent of the plants were grown from wild collected seed in places ranging from Japan to India. The gardens date from the late 1980s, when the property owner at the time decided to convert the abandoned rock quarries on her property into a lush garden. 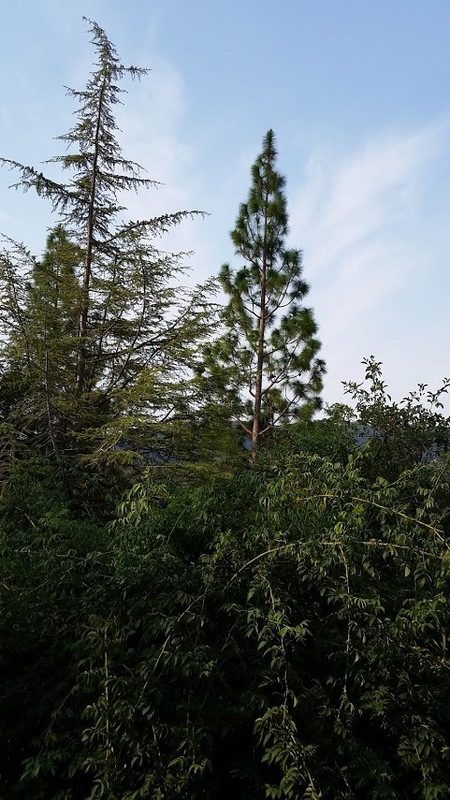 Quarryhill included many unusual conifers in their collection, which made it a great opportunity to see plants I will likely never see again such as Pinus roxburghii and Cupressus chengiana. However, I will admit that my favorite plant from the garden ended up being—of all things—a rose. 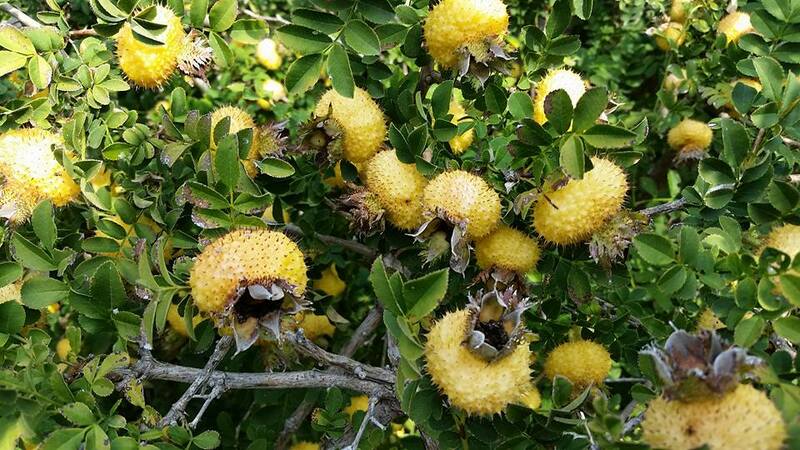 Rosa roxburghii features very large (nearly golf-ball-sized) hips of vibrant yellow with small, reddish spines covering their surface. Sure, it might not be conifer-relevant but it never hurts to learn a new plant, right? Our final stop on the trip was the San Francisco Botanical Garden (formerly Strybing Arboretum). Their 55 acres packed an incredible number of plants into one place. The conifer highlight of the garden was a very rare albino redwood. 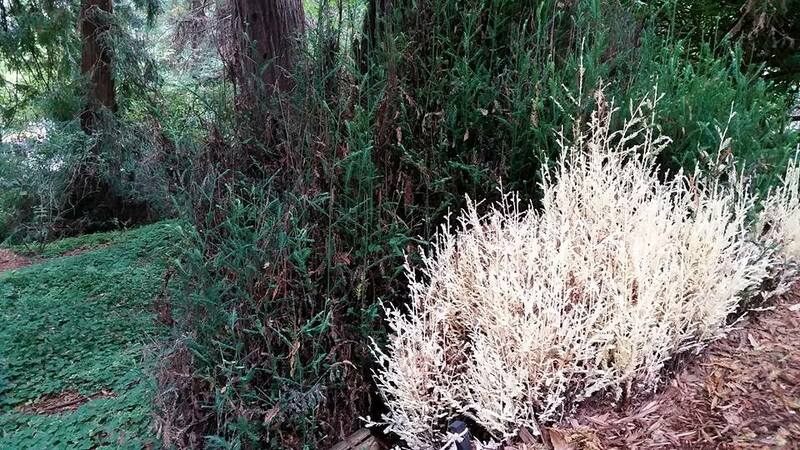 Unable to survive on their own, albino redwoods are mutations that lack chlorophyll, typically found growing at the base of an otherwise normal redwood tree. 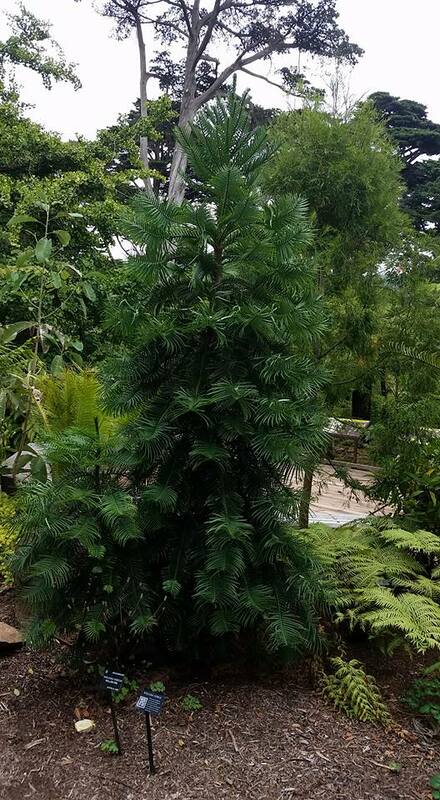 Other highlights included some magnificent specimens of conifers from the Southern Hemisphere including Araucaria and Wollemia nobilis, a tree that was only known from the fossil record until 1994, when a small grove was discovered near Sydney, Australia. We are fortunate to have a specimen of Wollemia on display in our Heritage Garden as well, but it was exciting to see a larger specimen such as this. In addition to seeing such an amazing array of plants in two days, this trip also gave me the opportunity to meet dozens of other professionals and hobbyists who share my love of conifers. The amazing thing about trips like this is seeing just how much there is in our world and how important it is to share ideas and see new things. If I had never taken this trip I would probably go on thinking that everything in northern California east of the coastal hills was a barren grassland, not an area teeming with native plants, and I never would have had a chance to meet so many interesting people, each with their own unique take on the world of conifers.